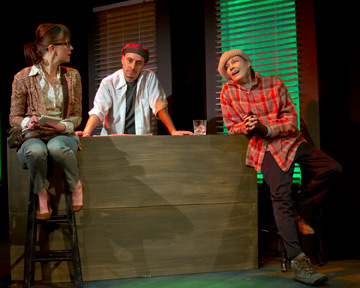 In “Bodega Bay,” the new play by Elisabeth Karlin now in a brief run at the Abindgon Theatre in New York City, the Hitchcock references fly fast and furious – but those not entirely educated in Hitchcock’s ouevre will enjoy its dark, funny story just as much as those of us who are steeped in the works of the Master of Suspense. menial job, Finch has never made time for herself. Now, with money running out, Finch decides to try and find the mother who abandoned them years before. Although she is desperate for more money, there is more to her quest, but exactly what that might be, she can’t say. Her journey takes her on a jagged route south and west, from the home of George Kaplan, her mother’s former boyfriend, to the office of a charming detective stricken with a fear of heights, and on a drive to Las Vegas with a drunk professor who will not remember her when he sobers up. Aside from O’Connor, the other five members of the cast each play multiple roles in the play: Rae C. Wright, for example, plays a barfly, a sassy caregiver, the aristocratic Mrs. Wordsmith and more. The cast takes on these roles with complete commitment, bringing the characters to convincing life. Similarly, the small stage serves as a variety of settings; lighting, sound effects and a few bits of furniture establish each location. Karlin takes advantage of the restriction of the theater and small cast, providing updates of what is happening with those not on stage by way of phone messages and appearances by Finch’s coworker back in the office. 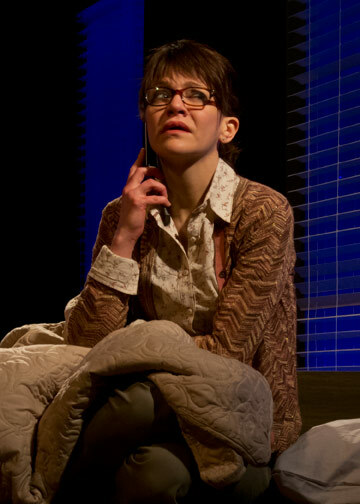 Although there is much humor in the dialogue, a melancholy mood hangs over the proceedings: Finch does not truly know whether her mother is even alive as she searches for her, and the dead continue to affect the living as she tries to remember her late father and their family life. And love, when it appears, is less about fireworks than the consoling warmth of commitment. As a contributor to the website Alfred Hitchcock Geek, playwright Karlin knows her Hitch. I enjoyed the references to movies, characters and situations that echoed those in Hitchcock’s films (including names like George Kaplan, Marie Samuels, Carlotta and Scottie). In speaking with director Sturgis Warner, I learned that there are over 200 such references in the play. The play does not rely on Hitchcock, though; in one scene, Finch meets a couple who are committed never to be more than ten feet from one another – a situation I heard about a few years ago in another context. 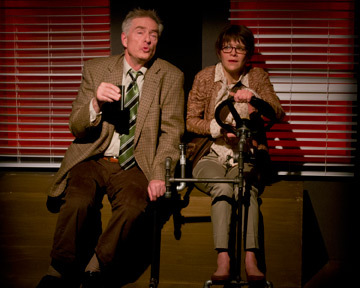 And while the viewer may catch on to the Hitchcock references, the characters know only their own struggles, right through to the smart, ambiguous end of the play. 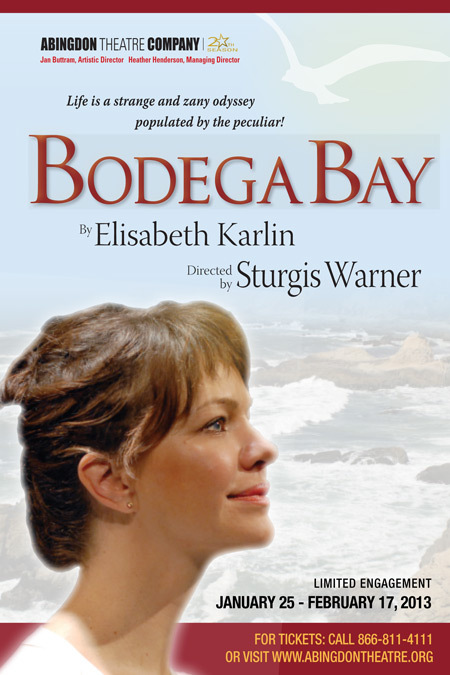 “Bodega Bay” runs at the Abingdon Theatre through February 17. Let’s hope it goes on to a longer run in the future. The book begins with think piece on the state of the cinema circa 1960, and how “Psycho” transformed both the growing awareness of serial killing and Robert Bloch’s book of the same name into an unsettling film that was unlike anything else in theaters at the time. It had more in common with Roger Corman’s low-budget shockers, which played mostly in drive-ins, than with other films of the time. 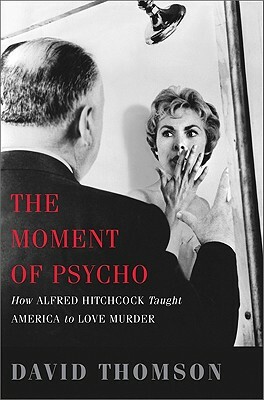 Indeed, to keep the studio off his back, Hitchcock invested his own money, with a controlling ownership of 60 percent of “Psycho.” As the majority shareholder, he was beholden to no one in his choices. Filming quickly, in black and white, with every scene carefully storyboarded and working with his television series crew, the shoot accomplished a hat trick that is usually considered impossible: It was fast, cheap, and good. And it was Hitchcock’s control of “Psycho” that made it what it was. At the time, he was still seen by Hollywood as a talented journeyman director, but the French saw him differently. In the pages of “Cahiers du Cinema,” the case was being made that Hitchcock was something else: an auteur, someone whose work as a director transcended the limits of Hollywood backlots to bring a unique vision to the screen. The real horror of “Psycho,” Thomson argues, is not mere murder and mayhem, but the way in which that bloody moment that shocked audiences follows forty minutes of the banal, depressing life of Marion Crane. It’s a life of furtive, go-nowhere affairs, sleazy clients, ill-conceived and impulsive thievery, an interminable drive, a vaguely threatening cop (whose mirrored shades force Marion to see herself), used-car salesmen and, finally, a rundown roadside motel. And while the young manager is welcoming and sweet, the motel is a place of shadows, stuffed birds and a shrill, unseen mother who’s “not herself.” Marion’s redemption is short-lived; she convinces herself that she can just return the stolen money, writing the sums earnestly, childishly, on a scrap of paper, before she takes the symbolically cleansing shower that seals her fate. If you’ve just seen the movie “Hitchcock,” which of course focuses on the making of “Psycho,” “The Moment of Psycho” would make a great postprandial refresher. Rather than looking at the struggles of making “Psycho,” David Thomson takes the long view on its impact. You can order your own copy of “The Moment of Psycho” here.